I don't remember the last time I made thumbprint cookies. I've had some less-than-stellar versions in the past and I decided it was finally time to come up with a recipe that I really like. After a little bit of tweaking, let me just say, these cookies are awesome! The best part...the dough is super versatile. It's a great, basic shortbread and is great as-is, but it also works well with a number of different flavor combinations. In fact, I have another recipe coming tomorrow using this same dough (as well as a few more in mind, so keep your eyes open). Make a double batch of this dough and save some of it for tomorrow's recipe! In a medium sauce pan, melt 1 c. butter over medium heat. Cook, stirring continuously, until butter turns brown and starts to smell nutty. Set aside and allow to cool to room temperature (or put it in the fridge to firm up just a little bit. Cream together the butter and sugar until light and fluffy. Mix in the vanilla and almond extract, scraping down the sides as necessary. Mix in the flour. Form the dough into a rectangle and wrap in plastic. Chill a few hours until firm (overnight is easiest). Dough will be pretty solid. Cut into 24 pieces. Roll into balls and make an indentation in the top. Chill dough again, 10-15 minutes or so. You want dough to be firm when you bake it. Preheat oven to 350 degrees F. Bake on a parchment lined baking sheet for 12-14 minutes. Allow to cool on baking sheet. While cookies are cooling, melt the chocolate and 2 Tbsp butter in a double boiler, or a heat proof bowl set over simmering water. 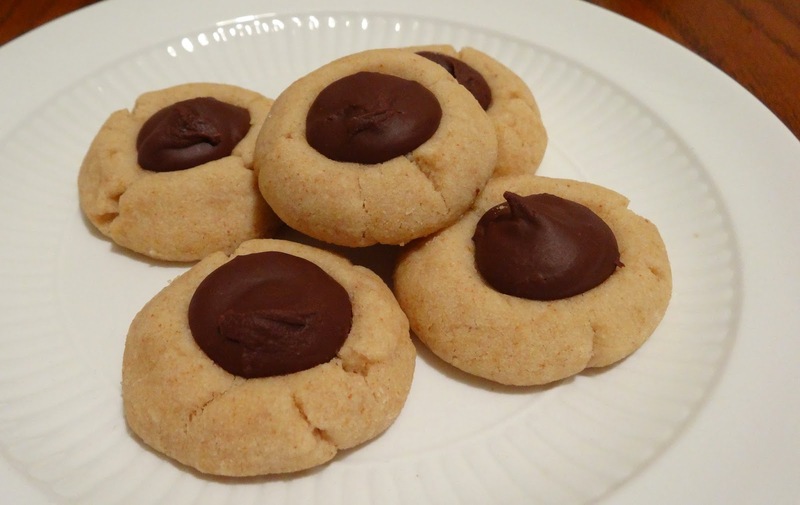 Spoon melted chocolate into "thumbprints" in cooled cookies. Allow chocolate to cool and set. Enjoy! Makes 24 cookies.